I wanted to share photos of this very beautiful Chevrot Bru reproduction. 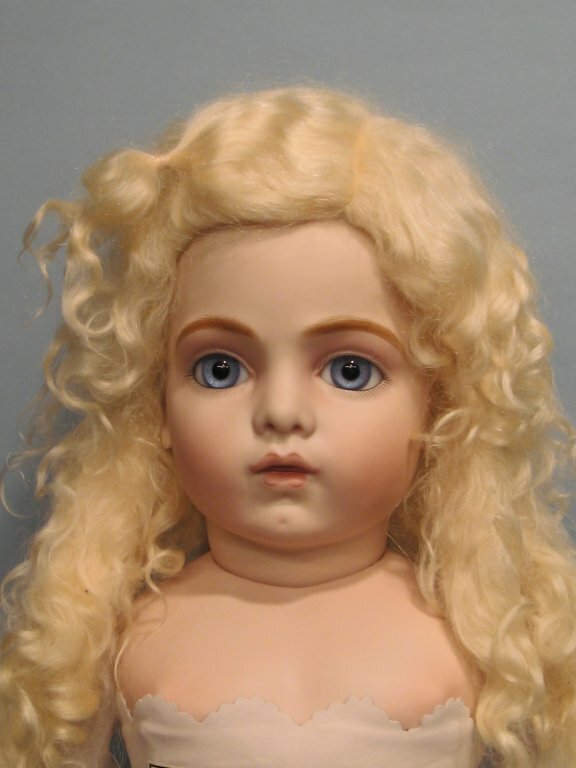 This 30" doll has been sold. It was a special order that took many months to complete. I will not be making more of this size Bru at this time but I do offer other smaller sizes of Brus on Chevrot bodies. This beauty has lovely light blue paperweights from the English company, Hand Glass. Those incredible eyes make all the difference, don't they? 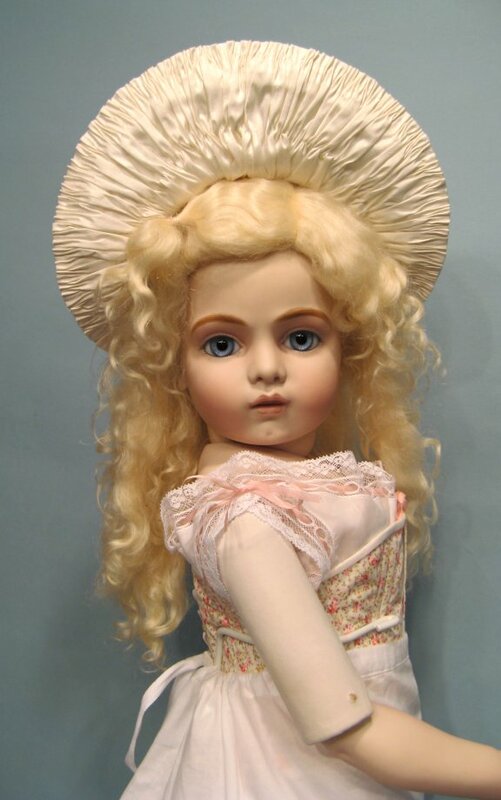 She is wearing a beautiful pale blonde mohair wig, with extensions. This wig is available occasionally from "j.a.k.elz", a seller on eBay. Her socks are made from a black cotton knit. Her shoes are made by Terese Tocci (e-mail: WilVixBree@comcast.net). 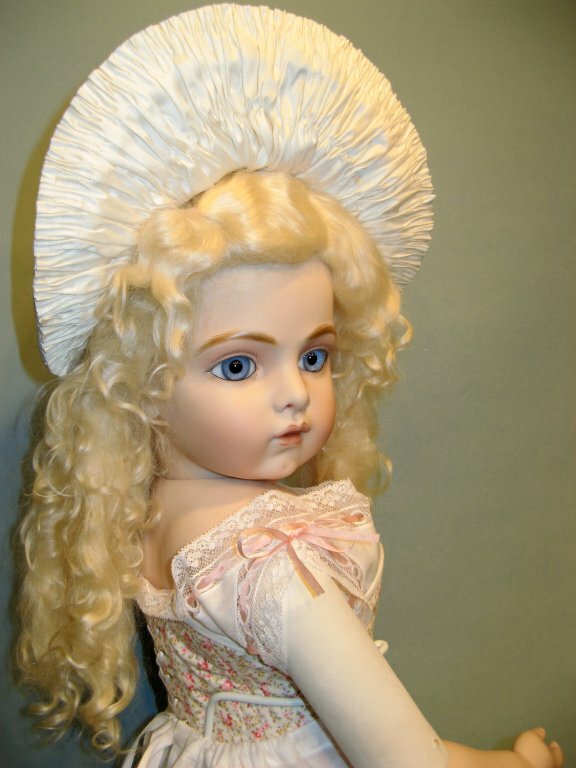 The bonnet was created by me and is made from a cream colored silk dupioni. The bonnet is wired and padded with cotton batting. The front brim is hand-shirred. 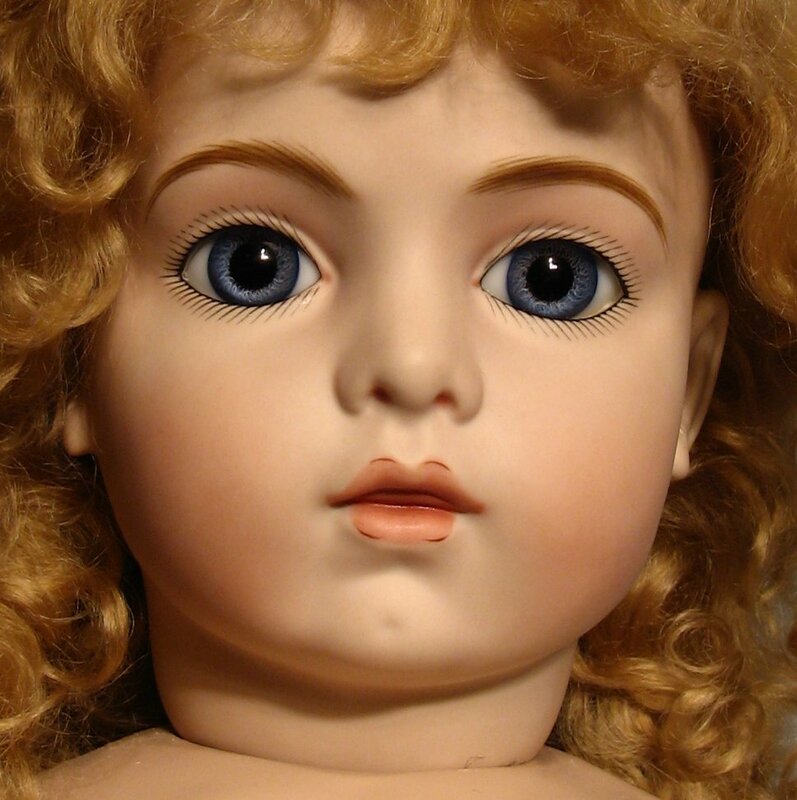 The doll head was painted by me, Suzanne McBrayer. 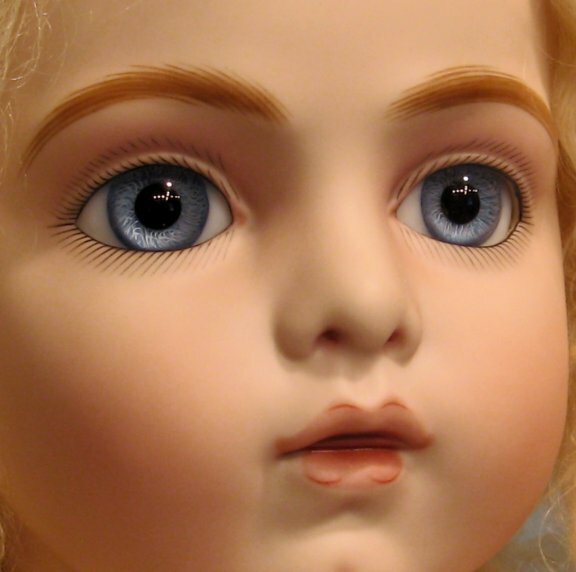 The doll parts and body were made by my husband, Alan, and me. 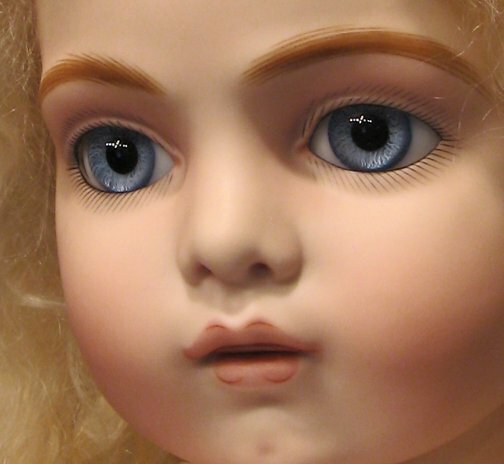 We tried to stay close to how the antique doll was made by having metal forms in some parts of the body. The leather is a gorgeous off-white with the softest feel to it. My husband also re-designed the Bru label that's on the chest of the doll. The label many people currently use is a photocopy of a drawn-by-hand design taken from original printed antique Bru labels. Although the photocopied label is nice, it does not have the same detail of an antique Chevrot Bru label. My husband, pixel by pixel, reworked the label to have the best detail available, so that it looked more like the original printed label. To do this, he used several reference books and an antique Chevrot Bru borrowed from a doll friend. I think the label is a nice improvement, don't you? I'm very proud of this doll...she was a hard one for me to let go! But the new owner has her standing with his antique Chevrot Brus inherited from his mother. What a wonderful idea...this "new" Bru can be with her "old" sisters! I'm sure she fits right in!